The Attribute Table widget displays a tabular view of operational layers' attributes. It displays at the bottom of your web app and can be opened, resized, or closed. When more than one layer's attributes display, multiple tabs automatically generate in the attribute panel allowing you to switch among the attribute tables. You can use the widget's configuration window to specify the layer or layers to be included in the tabular view, the fields show, and whether the tabular view can be exported. Layers from map services, feature services, and feature collections in the map are supported. The layers from map services and feature services require query capability to display in the table. The Attribute Table widget is an off-panel widget. Hover the over the Attribute Table widget and click the show or hide button to show or hide this widget in your application. The configuration window for this widget appears with a list of layers associated with the map. By default, all supported layers are listed in the table. If the service does not support query capability, the associated layer remains unchecked under Show. When you check it, a warning message appears instructing you to turn on the query capability of the service. 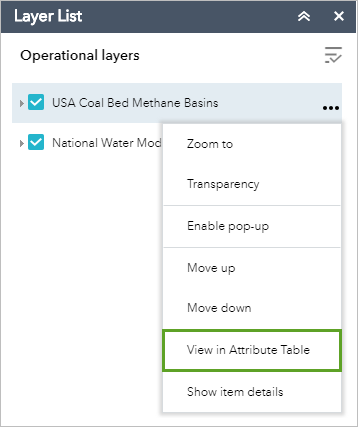 In addition, the Open Attribute Table button on the Layer List menu is unavailable for the layers without query capability. 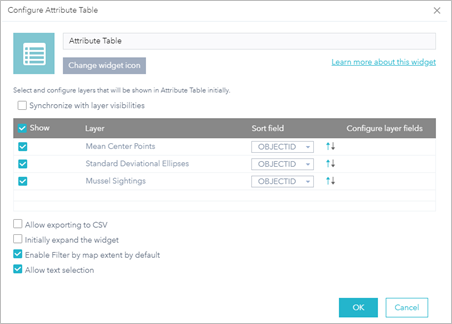 When the option, Synchronize with layer visibilities is checked, turning on and off layers in the Layer List widget will dynamically open or close the tabs in the Attribute table. Under Show, turn off the layer you don't want to display in the table. Under Sort field, define a field for the layer to be sorted by default. You can also choose to have the fields sorted in ascending or descending order when displayed in the table. Under Configure layer fields, click the edit button next to the selected layer and uncheck the fields you don't want to display in the table. Optionally check the Allow to export to CSV check box to allow users to export the attribute tables to CSV files. For Internet Explorer 8 and 9, you need to manually enter the .csv extension when you save the exported file. For Safari, you need to manually rename the exported file that is saved as Unknown by default. Optionally check the Initially expend the widget check box to open the Attribute Table widget when the app starts. Optionally check the Enable Filter by Map Extent by default check box to use this tool. Optionally check the Allow text selection check box to turn on text selection. The widget setting window closes. To turn it on, click the arrow button at the bottom of the map. To turn it off, click the arrow button at the top of the attribute table or click the X at the upper right of the table. Go to the Layer List menu and click View in Attribute Table. Select a record—Click a record in the table to select it and highlight the corresponding feature in the map with the color specified in the Attribute Table widget configuration window. Double-clicking a field in the selected record zooms to the feature on the map. Press the Shift or Ctrl key to select multiple records. Clear selections—Click the Clear Selection button to clear all selections. Zoom to selected features—Click Zoom to reset the map extent to center around selected features. Copy the field value—Double click the field value to highlight it, and right-lick it to copy the value. Refresh—Click Refresh to refresh the table. Sort a field—Click a field heading to sort the records by this field. The ArcGIS Server service has fewer features than the value of the MaxRecordCount property defined in the service. If the ArcGIS Server service has more features than the number value of MaxRecordCount, the ArcGIS Server version must be 10.3 or later, and properties for Supports OrderBy and Supports Pagination are set to true. Show or hide columns—Click the plus button on the right side of the attribute table panel to open the field visibility window. Check or uncheck the fields to set them to visible or invisible in the table. Number of selected records—Shown at the lower left of the table. Show Selected Records—Displays selected records. Show Related Records—Displays related records if a selected record has a related table. Filter—Filters records in the table. Filter by Map Extent—Displays attributes for features within the current map extent. Show or Hide Columns—Equivalent to clicking the plus button on the right side of the panel to set visibility for individual fields. Export to CSV—Exports the attributes to a CSV file. The x,y coordinates are included for the point feature layer and maintain the same spatial reference as the data regardless of the map projection. If records are selected, only the selected records are exported. If no records are selected, all the records are exported. To support this function, the Export Data property must be enabled for the corresponding feature service. For a feature layer, the maximum number of records exported to a CSV file depend on the maxRecordCount property set in the service when published. Clicking a record in the table highlights associated features on the map, and vice versa. The current version of Web AppBuilder for ArcGIS does not support attribute editing or feature deletion using the Attribute Table widget. If the table does not display the editor's name correctly when editor tracking is enabled in the feature layer, see this technical article for a possible workaround.